If you are concerned with overpopulation, you may have noticed that The Bet is back in the news. The Bet involved Paul Ehrlich who, for those of you too young to remember, was the Stanford biologist who scared the bejeezus out of us on TV in the late 1960s (and in his best-seller, The Population Bomb). Channeling Robert Malthus, Ehrlich insisted that out-of-control population growth had already sealed the fate of tens of millions who would soon starve, no matter what we did. (His moment of Malthusian inspiration came from an uncomfortable taxi ride in Delhi — which he completely misinterpreted). Ehrlich’s most vocal critic was free-market economist Julian Simon, who claimed population growth to be a driver of economic expansion which overall benefited the masses instead of dooming them. Th eir debate was very public and entertaining, and they managed to take a multi-faceted issue and dumb it down to the intellectual level of bumper stickers: population BAD, population GOOD. They bet on whether the value of a set of minerals would drop or rise over a 10-year period; they dropped (even though population soared) and Ehrlich lost. Opinions were divided on how to interpret this. Did it destroy Ehrlich’s credibility on population and resources (if it wasn’t already destroyed after blowing the prediction that millions would run out of food)? Or did Simon just get lucky? Much has been written about The Bet (for instance, in Wired), but suddenly it is back in the news in a big way. Last week I got an advertiement for a whole book on it — The Bet: Paul Ehrlich, Julian Simon, and Our Gamble over Earth’s Future, by historian Paul Sabin. And Sabin also got an opinion piece in the 9/8/13 New York Times on it. Since this attention is new, a lot of people are trying to figure out what to make of The Bet. The book blurb and the NY Times opinion piece make a clear recommendation on how to make sense of it — it is all about “the clash between environmentalists and their conservative critics.” Seems like a great way to get people’s attention and maybe even get their blood up: it’s all about conservatives and liberals, it’s a battle in the war between free-market and environmentalism, Hummer vs. Prius, fracking vs. solar, wingtips vs. Birkenstocks. The problem is this is completely misleading. The most important critiques of Malthus, and his modern acolytes like Ehrlich, come from the left. The Bet, and the whole issue of “over”-population, makes no sense as a 2-sided debate. In fact it has been a 3-way debate all along. 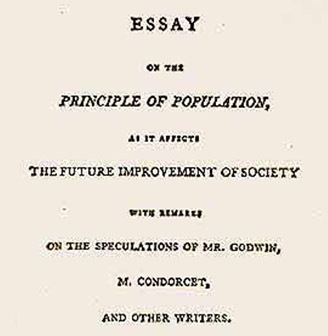 It’s right there in Malthus’s original booklet, entitled “An Essay on the Principle of Population As it Affects the Future Improvement of Society with Remarks on the Speculations of Mr. Godwin, M. Condorcet, and other Writers.” Whereas Condorcet argued that farming could keep up with population, and Malthus argued that it couldn’t, Godwin argued that population wasn’t really the problem – social institutions were. In his wonderful book How Many People Can the Earth Support?, Joel Cohen put the 3 perspectives this way: we can have fewer diners at the table, we can bake a bigger pie for the diners we have, or we can teach better table manners. It is these Table Manners advocates that are being erased when the overpopulation debate is reduced to environmentalist vs. conservative, which is a particular shame because today they have most of the facts in their corner. Table Manners theorists have different political viewpoints but most would be considered to be to the left of Malthus. Godwin himself was an anarchist. Karl Marx was not an anarchist at all, but he was a fierce critic of Malthus’s book, calling it a “schoolboyish, superficial plagiary” that caused a sensation only because it appealed to factory owners (who liked the idea that their workers’ poverty and hunger were natural — there were just too many people at the table). In the 1890s, with grain prices plummeting due to gluts, Friedrich Engels asked how anyone could take seriously Malthus’s theory that population pressed against the means of subsistence, when “the means of subsistence are pressing against the population, which is not large enough to consume them.” There are plenty of Better Manners theorists around today, including economist Amartya Sen, a 1996 Nobel laureate for works such as Poverty and Famines. Ehrlich (and other Fewer-Diner theorists) cite figures on hunger and malnourishment and let people assume there must be food shortages, but there almost never is; instead there is poverty and there are societal decisions that food is not an entitlement (as Sen shows). My favorite example is India, which has the most hungry people of any country and also a perennial problem with oversupply of rice and wheat. They also point to environmental problems from our food production and let people think it all results from rising population, which is misleading. Like Malthus, the original Fewer Diners theorist, they blame population for all manner of social maladies that have nothing to do with population. I have always thought The Bet was a good story, but does it really teach us anything? Simon was betting that prices of commodities would drop because population made everything better; Ehrlich bet they would rise because population made everything worse. If you are are trying to decide whether the answer to the question of who was right is a)Simon or b)Ehrlich, you may want to consider c)neither. How could there be too many diners at the table when we have so many leftovers? And how can the bakers get credit for solving our problem when they have served us pie as an entree and trashed the kitchen? This entry was posted in Agriculture, Food, Population. Bookmark the permalink. 12 Responses to Overpopulation? Don’t Bet On It. Thanks for a very interesting post. I have been hearing all my life that we will run out of food soon but we seem to just make more and more. But the idea keeps coming back again and again. The idea has served many interests over the years. It’s interesting how often people worry that in the future people might die because we can’t make enough food, when in the present people are already dying because we make too much food — and make it poorly. My blog cited a paper on Community-Acquired MRSA which has been traced back to swine factory-farms; in an article today, Tom Philpott reports that Half of China’s Antibiotics Now Go To Livestock. TR Malthus was the conservative voice in his own times, right? It is interesting that the overpopulation idea got taken over by environmental liberals. On most policy matters, yes, Malthus took positions that resonate with economic conservatives today. In POPULATION he was basically putting a “laws of nature” spin on an anti-welfare argument. But he was attacked from religious perspectives too (even though he was a minister) which complicates the picture. Religious critics questioned why God would have set up rules of nature in which so much misery was integral, which is a pretty good question. TRM essentially said that it was to give us a challenge. I can accept that some people have blamed population for big problems that werent really population’s fault. But it seems to me that people also blame modern agriculture for big problems that might not be its fault. I think a lot of these claims are made by the organic food industry. Well, the link between swine factory-farms and MRSA is emphasized by the organic industry, but it doesn’t originate with them. It comes from dozens of studies in peer-reviewed microbiology, medicinal, veterinary, and general science journals. Here’s a bibliography, but more has appeared since this was compiled. The only thing it has to do with overpopulation is that lawmakers’ offices are overpopulated with ag industry lobbyists. Excellent commentary, as always. It’s great to see you return to the blog. I would suggest people look at a book, Food Movements Unite! from Food First. The problem is lack of policy. As long as we think of corn and soybeans as “food”, while they are really protein, carbohydrates, and oil which are produced as commodities (more produced in anyway, externalizing costs while turning Mother Earth into money) used to feed livestock and ethanol plants for the wealthiest people in each country, we will have gluttony alongside (across the tracks) malnutrition. We need policy to break this cycle, where everybody thinks that cheaper food and energy is better, when in fact it perpetuates corporate control and makes us all travel the road to ecological oblivion. Thanks, and it’s good to hear from George Naylor whose work I admire. Food First puts out a lot of very good books. True to their name, they are actually concerned with food. Thanks for a super post. Coming from Europe, we used until quite recently to hear more about overproduction of food (leading to depressed farm prices), which is interesting because europe is the second most populous continent (by density). This is why we had the set-aside policy by which farmers were forced to leave land fallow every year. Then food shortages (within the last ten years) became a media preoccupation, even though the EU expanded hugely by area to include agriculturally rich and relatively low population countries like Romania. From all this I now have concluded that the food shortage discussion is no longer driven by data but has become a PR stunt in which talk of actual, future or potential, food shortages is used to drive fear of sustainable agriculture, which the same people argue is less productive.